It’s here: CBPP’s top graphs of last year! Happy new year and welcome to the Center on Budget and Policy Priorities top graphs of 2016 special! I’ll be your host, joined later by musical guest…whoops, sorry. What with the urgency of the moment, there’s no space for a band this year. So let’s jump into the facts and figures (and to be clear–and fair to my CBPP colleagues–this is but a small sample of our best stuff; take my advice and, if you haven’t already, bookmark our site and visit it often; current threats have us shifting into overdrive). This year’s theme is a somber one: the fragility of the gains we’ve made. 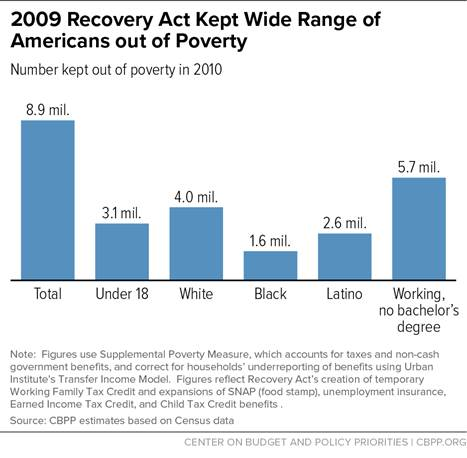 First, the GOP appears poised to engage in a War on Poverty Programs. In order to help finance their highly regressive tax cuts, they’re likely to target programs like Medicaid and SNAP (food stamps), e.g., by turning them into block grants to states. This robs these programs of their vital countercyclical impact, like that shown in the figure below. Back in 2010, as the Great Recession was pummeling low-income households, the safety net did what it’s designed to do: catch people when the market fails. What’s that? You’re skeptical that block grants would truly undermine the effectiveness of our anti-poverty programs. Well, observe this next figure, showing the growing failure of cash assistance to reach needy families since it was turned into a block grant back in the mid-1990s. 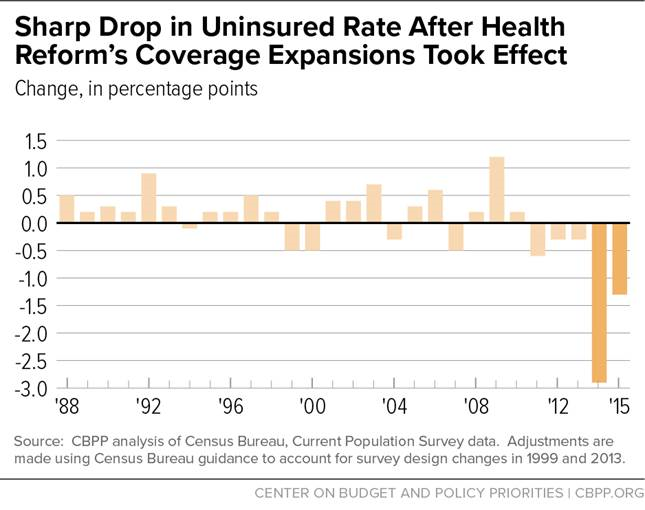 Here’s another huge gain to low- and middle-income households that’s at risk of being lost: the decline in the share without health coverage. It seems increasing clear that president-elect Trump and the GOP Congress are firmly united in repealing the Affordable Care Act. When it comes to replacing it to stave off the lost coverage that will then beset millions of households…well, that they’re not so sure about. I’ve got a theory: Team Trump jams through a big, wasteful supply-side tax cut based on trumped-up growth assumptions. When offsetting growth fails to appear of the scene, they throw up their hands in despair and insist that Social Security and Medicare must be cut to stave off the rising debt. 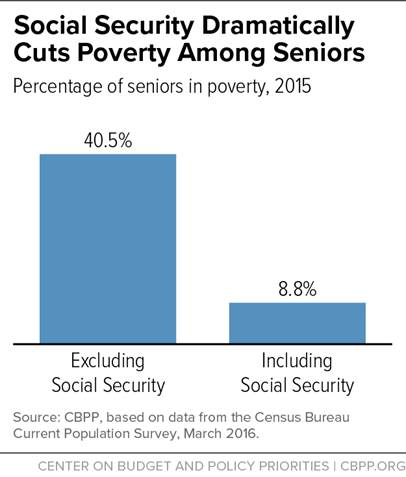 Of the many figures we’ve published showing the importance of social insurance programs, this one showing Social Security’s poverty-reduction impact on seniors is particularly intuitive. Absent Social Security income, there’d be about 4.5 times more elderly poverty than there is today. A good place to start is raising the “tax-max”: the salary threshold above which the payroll tax no longer applies. 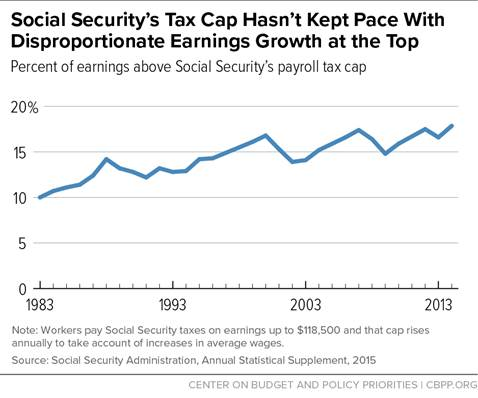 Because of the rise in earnings inequality, an increasing share of earnings is above the cap. The next figure shows that used to be about 10 percent; now it’s about 17 percent. You know what else is at stake? The increase in the overtime threshold. A Texas judge blocked the rule from going into effect last month, but his decision was so obviously flawed, one hopes it would be reversed on appeal. But Republicans and even some Democrats have long been trying to repeal or dilute the rule change, which as the figure shows, is but a partial update to the salary threshold under which workers must be paid time-and-a-half for overtime. 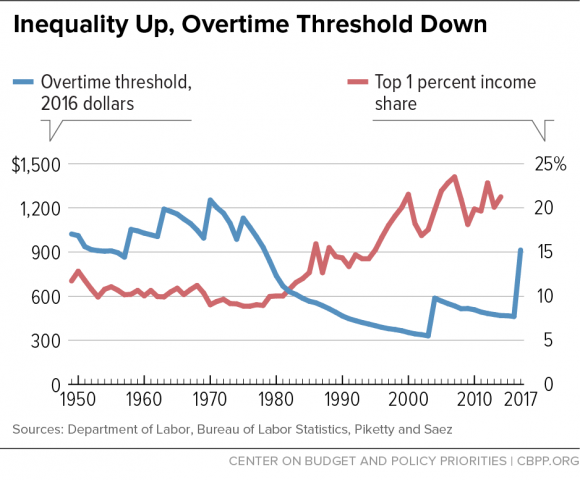 The figure plots the overtime threshold in real terms against a measure of the rise in inequality. 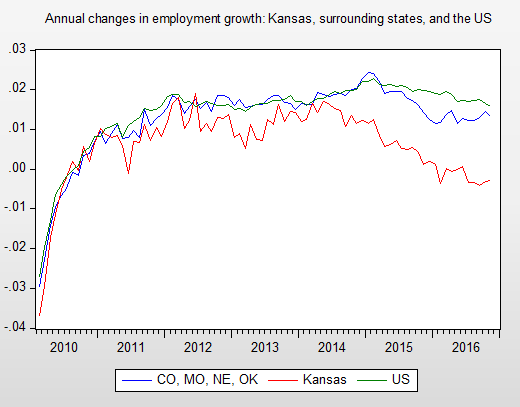 The point is less that one caused the other than to show the joint evolution of eroding labor standards and much less equitable economic outcomes. Another thing at stake going forward is any sense of fiscal accountability. We’ll see what the ultimate Trump tax plan looks like but we’ve produced a number of figures showing the extent to which they’re heavily tilted toward the wealthy, though cutting rates and business taxes, cap gains and dividends, and repealing the estate tax (now there’s an idea to reach his blue-collar base…). 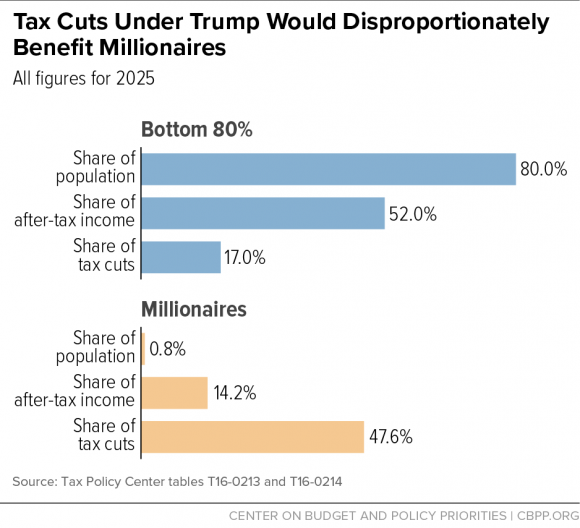 Here’s one showing that while millionaires comprise less than 1 percent of all households, they end up with close to half of Trump’s tax cuts while the bottom 80 percent get less than a fifth. Same with the repeal of the ACA. 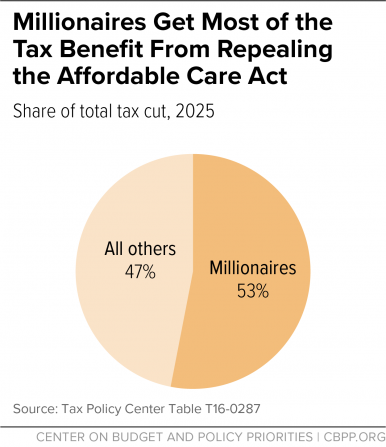 Like I said above, repeals whacks those with coverage, but we also show that the taxes supporting the program are progressive, so repeal also delivers more than half of the tax benefits to…wait for it…that same itty-bitty group of millionaires. To state the obvious, this is a pretty chilling example of Trump’s faux populism: take from the poor/middle-class and give to the rich. What about the trickle-down claims? I suspect that in coming months we’ll see a fair bit of dynamic-scoring abuse: model-based estimates of the growth effects of the coming tax cuts. Such models cannot generate reliable point estimates of their macro impacts and worse, they’re easily gamed to show large growth effects. So our best move is to look at the history of tax cuts and growth. From the perspective of progressive political economy, last year was an awfully tough one on many fronts. OTOH, that makes it a good year for interesting graphics, which reminds me of the old saying: “may you live in uninteresting times.” Either way, you can count on me and my CBPP colleagues to continue to produce accurate, timely analysis that I suspect will be even more important this year as we document the pending threats to much that we value. 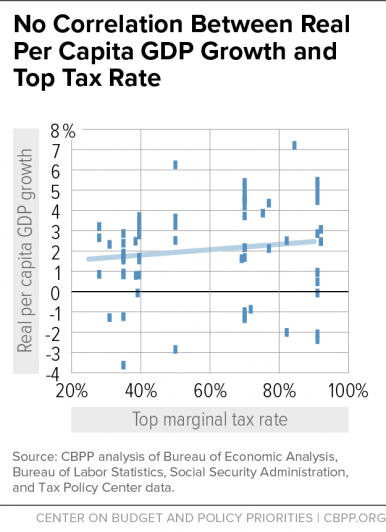 Share the post "It’s here: CBPP’s top graphs of last year!" 2 comments in reply to "It’s here: CBPP’s top graphs of last year!" 1) Agenda These graphs may be useful to policy wonks, but they provide little to nothing where it counts, in public opinion. I’d never post any on social media. 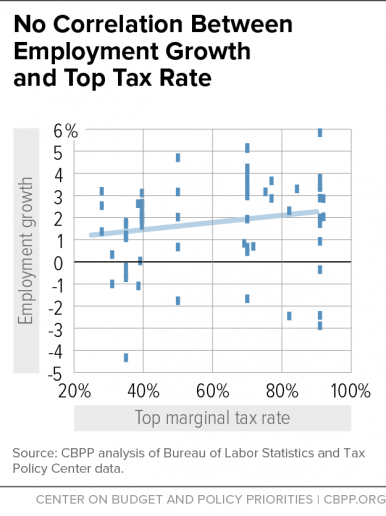 After tax income severely distorts and underplays the degree of income inequality. That’s why Piketty discusses before tax income. 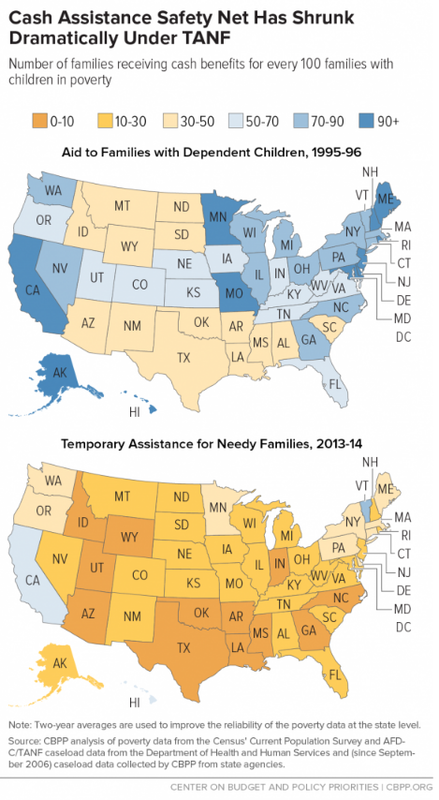 TANF is useful in showing how benefits can be cut, without dire consequences. The overtime threshold is Obama ignoring a very important labor issue until his last year in office, no congressional approval required. Letting the nominations of the NLRB get sandbagged is why we’ll have a conservative Supreme Court. It displayed weakness and Republicans drew the very relevant lessons from it. 2) ACA The Republicans can destroy it before it goes out of business by repealing with a future expiration date. When it blows up because of their repeal, they can say it collapsed of it’s own weight. Why isn’t this central fact becoming the main message of Democrats trying to defend it (you included)? 3) Social Security and Medicare are still currently running surpluses. Why aren’t Democrats promoting the idea to stop stealing from it to halt tax cuts. Why aren’t they saying now the millionaires tax cuts are paid for with your future Social Security? The Republicans will grandfather all current recipients, but there are plenty of middle aged white working class who want to retire when they’re 67. Pennsylvania has one of the oldest demographics in the country (next to Florida and Arizona where they’re already collecting). 4) How come no one’s mentioned all the Republicans’ plans eliminate deductions of state and local taxes. That’s a big deal in New York and California. What’s the projected to hit? The message should be simple, the country can’t afford tax cuts for millionaires. It’s stealing from Social Security and Medicare.